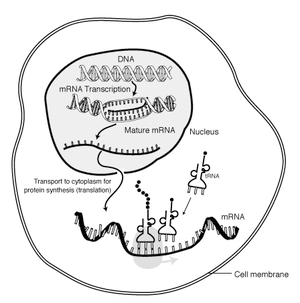 The "life cycle" of an mRNA in a eukaryotic cell. RNA is transcribed in the nucleus; processing, it is transported to the cytoplasm and translated by the ribosome. Finally, the mRNA is degraded. Messenger RNA (mRNA) is a large family of RNA molecules that convey genetic information from DNA to the ribosome, where they specify the amino acid sequence of the protein products of gene expression. Following transcription of primary transcript mRNA (known as pre-mRNA) by RNA polymerase, processed, mature mRNA is translated into a polymer of amino acids: a protein, as summarized in the central dogma of molecular biology. Polyadenylation site mutations also occur. The primary RNA transcript of a gene is cleaved at the poly-A addition site, and 100-200 A’s are added to the 3’ end of the RNA. If this site is altered, an abnormally long and unstable mRNA construct will be formed. Eukaryotic mRNA that has been processed and transported to the cytoplasm (i.e., mature mRNA) can then be translated by the ribosome. Translation may occur at ribosomes free-floating in the cytoplasm, or directed to the endoplasmic reticulum by the signal recognition particle. Therefore, unlike in prokaryotes, eukaryotic translation is not directly coupled to transcription. An mRNA molecule is said to be monocistronic when it contains the genetic information to translate only a single protein chain (polypeptide). This is the case for most of the eukaryotic mRNAs. On the other hand, polycistronic mRNA carries several open reading frames (ORFs), each of which is translated into a polypeptide. These polypeptides usually have a related function (they often are the subunits composing a final complex protein) and their coding sequence is grouped and regulated together in a regulatory region, containing a promoter and an operator. Most of the mRNA found in bacteria and archaea is polycistronic, as is the human mitochondrial genome . Dicistronic or bicistronic mRNA encodes only two proteins. Different mRNAs within the same cell have distinct lifetimes (stabilities). In bacterial cells, individual mRNAs can survive from seconds to more than an hour; in mammalian cells, mRNA lifetimes range from several minutes to days. The greater the stability of an mRNA the more protein may be produced from that mRNA. The limited lifetime of mRNA enables a cell to alter protein synthesis rapidly in response to its changing needs. There are many mechanisms that lead to the destruction of an mRNA, some of which are described below. mRNA is currently being investigated for its potential use in the treatment and prevention of diseases. mRNA-based vaccines are being developed as cancer immunotherapy and prophylactic vaccines for infectious diseases. mRNA is also being studied as a source of therapeutic gene products and protein replacement therapies in vivo. ↑ Kierzkowski, Daniel; Kmieciak, Maciej; Piontek, Paulina; Wojtaszek, Przemyslaw; Szweykowska-Kulinska, Zofia; Jarmolowski, Artur (September 2009). "The Arabidopsis CBP20 targets the cap-binding complex to the nucleus, and is stabilized by CBP80". The Plant Journal. 59 (5): 814–825. doi:10.1111/j.1365-313X.2009.03915.x. Retrieved 12 December 2014. ↑ Sträßer, Katja; Masuda, Seiji; Mason, Paul; Pfannstiel, Jens; Oppizzi, Marisa; Rodriguez-Navarro, Susana; Rondón, Ana G.; Aguilera, Andres; Struhl, Kevin; Reed, Robin; Hurt, Ed (28 April 2002). "TREX is a conserved complex coupling transcription with messenger RNA export". Nature. 417 (6886): 304–308. doi:10.1038/nature746. PMID 11979277. Retrieved 12 December 2014. ↑ Katahira, Jun; Yoneda, Yoshihiro (27 October 2014). "Roles of the TREX complex in nuclear export of mRNA". RNA Biology. 6 (2): 149–152. doi:10.4161/rna.6.2.8046. Retrieved 12 December 2014. ↑ Cenik, Can; Chua, Hon Nian; Zhang, Hui; Tarnawsky, Stefan P.; Akef, Abdalla; Derti, Adnan; Tasan, Murat; Moore, Melissa J.; Palazzo, Alexander F.; Roth, Frederick P. (2011). "Genome Analysis Reveals Interplay between 5′UTR Introns and Nuclear mRNA Export for Secretory and Mitochondrial Genes". PLoS Genetics. 7 (4): e1001366. doi:10.1371/journal.pgen.1001366. ISSN 1553-7404. PMC 3077370 . PMID 21533221. ↑ Steward, Oswald. "Preferential localization of polyribosomes under the base of dendritic spines in granule cells of the dentate gyrus". Journal of Neuroscience. 2: 284–291. ↑ Steward, Oswald (2001). "Selective targeting of newly-synthesized Arc mRNA to active synapses requires NMDA receptor activation.". Neuron. 30: 227–240. ↑ Spatial regulation of bold beta-actin translation by Src-dependent phosphorylation of ZBP1 Nature04115. ↑ Lu, YF; Mauger, DM; Goldstein, DB; Urban, TJ; Weeks, KM; Bradrick, SS (4 November 2015). "IFNL3 mRNA structure is remodeled by a functional non-coding polymorphism associated with hepatitis C virus clearance.". Scientific reports. 5: 16037. doi:10.1038/srep16037. PMID 26531896. ↑ Mercer, Tim R.; Neph, Shane; Dinger, Marcel E.; Crawford, Joanna; Smith, Martin A.; Shearwood, Anne-Marie J.; Haugen, Eric; Bracken, Cameron P.; Rackham, Oliver; Stamatoyannopoulos, John A.; Filipovska, Aleksandra; Mattick, John S. (2011). "The Human Mitochondrial Transcriptome". Cell. 146 (4): 645–658. doi:10.1016/j.cell.2011.06.051. ISSN 0092-8674. ↑ "sp2 Inter-Active". September–October 2012.